I met Nori in the Jugendherberge in Bremen in 2012, where he was on a long bicycle trip from Paris, up through Denmark, Sweden and Finland and further on through Eastern Europe to Istanbul. We've been in contact since then and I had the idea that going to Japan I would at least know one person there. Besides I didn't know much about Japan, but that's why you travel - to learn new things. As usual I searched for informations from others that had travelled the country, but didn't find much. I followed my routine travelling for 60 days. That's due to the paragraphs in my insurance. 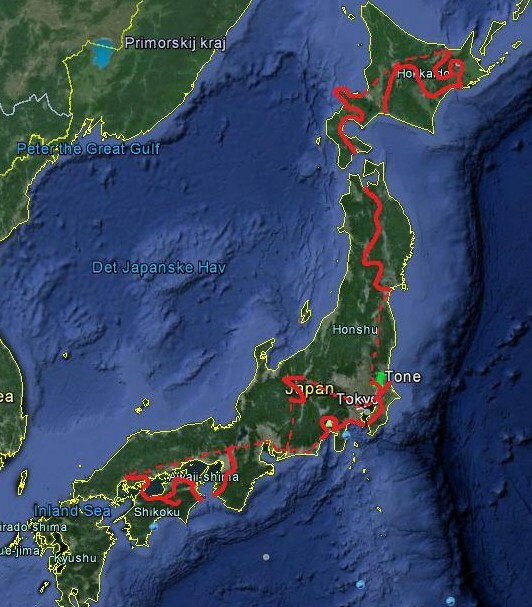 Made a plan that would take me all around Japan. It would take me at least 90 days, so when I arrived 13.08.13 I knew that the plan needed adjustments. Bought a bicycle bag in Tokyo in the start, so I was able to go by train too and followed the plan: to start up north while it was hottest and work my way south from there. The route went to Oarai. With a ferry to Hokkaido. Around most of Hokkaido. With a ferry to Aomori. Further on through Tohuko (northern Honshu) to Sendai. With the train to Omiya and back to Tone. Further on south to the ferry across the Tokyo Bay to Karihama and along the coast. Due to a typhoon I gave up the Izo penninsula and left the coast for Gotemba, where I stayed while the typhoon passed. Around Mt. Fuji to Fujinomiya and Shizuoka. With the train to Kyoto. From Kyoto to Nara and Wakayama. With a ferry to Tokushima in Shikoku. To Naruto and Takamatsu. South west to the Iya valley in central Shikoku. To Imabari. Across The Inland Sea on the bridges to Onomichi and Hiroshima. With train to Takayama. Across the mountains to Matsumoto. North to Hakuba and in the end Nagano. Back with the train to Tokyo og Tone.